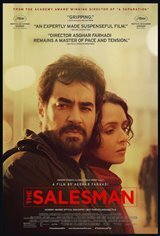 An Iranian couple, Emad (Shahab Hosseini) and his wife Rana (Taraneh Alidoosti), are forced to move to a new apartment in Tehran when the building they were living in collapses. The new apartment is spacious and better than they'd hoped for, but there's one drawback. The former tenant, a woman, left half her belongings in the apartment, but the landlord assures them she'll come for them up soon. One night when Emad is out, a man enters their home and attacks Rana. Emad comes home and finds bloody footprints leading out of their home. Rana, who was in the shower when the intruder showed up, was struck on the head. She's taken to the hospital and gets stitches, but won't let Emad report the attack to the police. As they try to cope with the aftermath of the attack, Emad becomes obsessed with the identity of the intruder in order to exact revenge.